19 Oct 2018 --- Arla is bringing its follow-on formula to UK parents with a new range of baby products. The dairy co-operative is aiming to build on the success seen in Denmark and China by extending the Arla Baby&Me Organic brand which will include porridge and pouches, with the launch also seeing Arla step up its digital ambitions with the UK’s first direct to consumer offering. Baby&Me Organic brings Arla Foods’ heritage in dairy products to the formula category in the UK for the first time. The farmer-owned co-operative which is the biggest producer of organic milk in the world has been producing follow-on formula for over 30 years, with its milk production history spanning over 130 years. are sold via online platforms through a direct to consumer (DtC) model. Supported by a full marketing launch that seeks to build an emotional connection with parents, the UK launch will see a market first for Arla as Baby&Me products are sold via online platforms through a direct to consumer (DtC) model. As Arla looks to increase its presence across digital channels, Baby&Me will be available from the Arla Foods UK website and Amazon Marketplace. The new channel approach will allow Arla to engage directly with consumers, provide a convenient shopping solution and maximize sales through e-commerce. According to Arla, this digital-first approach enables the company to offer consumers a convenient solution for formula milk and baby foods within the Baby&Me Organic range. It also means they can simply order at home and have the products delivered directly using a third-party selling model. 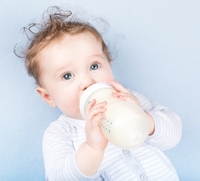 Baby&Me infant formula will be available to purchase with home delivery from Arla’s UK website or Amazon Marketplace. “We have big ambitions for our e-commerce model globally at Arla and see the launch of the UK direct to consumer platform as another step to increasing our digital offering,” concludes Millard.